I’ve talked before about the importance of conflict in a story. This is all well and good to know, but what forms, exactly, can conflict take in a story? At its most basic, conflict in a story takes one of six different forms. Man Against Self. In a story about inner conflict, the character from whose point of view the story is told fights mainly against him- or herself. Think of Louis in Anne Rice’s Interview with the Vampire; Louis struggles against his own ambivalence regarding his new vampire nature. The risk you run in detailing this sort of conflict, of course, is a far too introspective tale, but because it focuses on human nature, it can also be the most rewarding to write. Man Against Nature. This type of conflict focuses on an individual who seeks to overcome natural elements: he or she seeks to scale a mountain, or survive three days in the wilderness, or cross an ocean. One of the most notable “man against nature stories,” of course, is Jack London’s Call of the Wild. These types of stories tend to be Realist in tone; when it comes down to it, humans simply cannot overcome Mother Nature – not for long, anyway. Man Against Society. Probably the favorite of the bohemian artist set, this sort of narrative usually pits a misfit against a conformist society. He or she may seek to enlighten, liberate, flee from, or simply survive in such a society, but society as a whole wants him out of the way. Richard Matheson, in his I Am Legend, puts a fascinating spin on this conflict: only one human, Robert Neville, exists in the whole world – and all of the undead want to drink his blood. Man Against Machine. Rapidly rising in popularity in our increasingly mechanized society, this sort of conflict usually depicts a human fighting against machines, which are conveyed as soulless or even demonic. Think of the 1927 Fritz Lang classic Metropolis, in which the hero, Freder, battles the man-killing machines of the dystopian Metropolis. These types of stories usually fall in the sci-fi camp. Man Against God. In a story featuring this type of conflict, an individual fights a capricious or cruel god or gods; mythologies of many people focus on this sort of conflict. Many times, the hero or heroine overcomes the gods either through trickery or sheer valor, but in other stories, the hero fails and is condemned to eternal punishment. 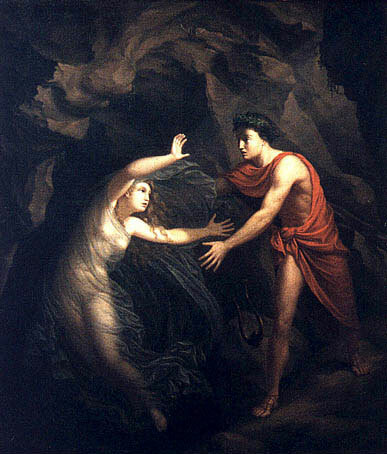 For example, take Orpheus, who wins the right to retrieve his dead wife, Eurydice, as long as he does not look behind him as they leave the Underworld. But, of course, before he can lead her all the way out of Hades, he turns to look at her, thus violating the agreement – and losing her again. God Against Everybody. Possibly the most sweeping type of conflict concerns a god dead set on destroying all of humankind; again, these stories usually fall in the mythological camp. Think of the many mythological destruction narratives, such as an Egyptian tale in which the gods, annoyed with the amount of noise humans make, decide to send the goddess Hathor down to wipe out the pestilence of mankind. Today, these types of stories would be classed as fantasy, though they need not be. Endless variations on these conflicts exist, and of course, there’s no reason multiple conflicts can’t happen within the same story. And no matter how complicated the plot, at the core of any good story, you’ll find a conflict driving the action.